The Emergency Bag is probably over-named. Perhaps it should be the “Boy Scout” Bag (Be prepared). Or maybe call it what it truly is, which would be the “Spare Clothes In Case I Fall In and Other Miscellaneous Outerwear I Might Need” Bag. But, I’ve always called it the Emergency Bag, and so it is. The cool thing about the Emergency Bag is that if you go to the river on the one day of the month when they’re calling for the deluge, and it hits, and you’ve forgotten your Gore-Tex rain jacket, that old rubber one you keep inside its blue confines comes in right handy. So, to the fishing. I had to run a quick errand at UpCountry Sportfishing, and of course rest stops were an imperative on the drive home. The lower river was low (295cfs) cold, and was largely devoid of hatch activity. I managed to hit two spots before the heavens opened, and took one trout on a size 12 SHPHPT. My final stop produced one more take in a good old-fashioned Noah’s Ark downpour, but as I was bringing the fish in, lightning hit close enough to make me rethink the wisdom of holding an aluminum-tipped pole while standing in a river. So I disengaged and sprinted for the safety of the truck. A little shaken, but quite dry. And I owed it all to the Emergency Bag. Come to papa. Playing tug-of-war with a standard-issue rainbow. 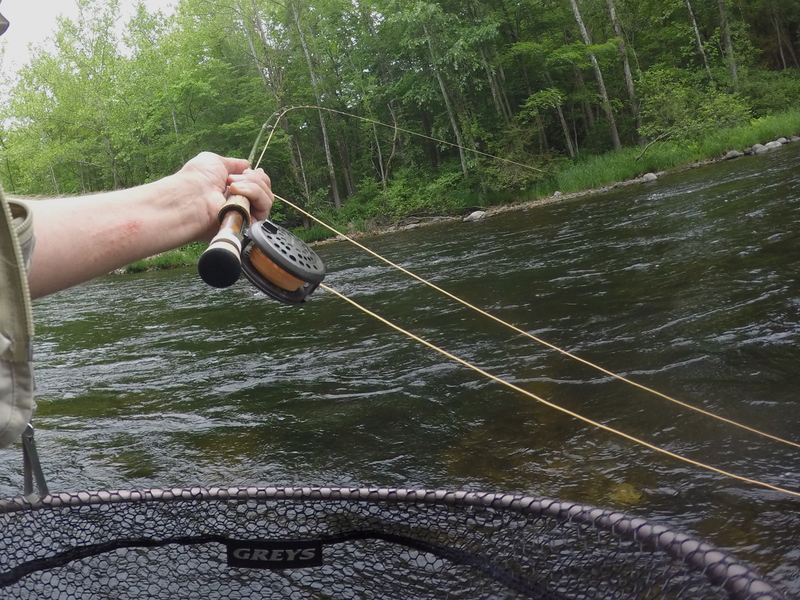 This entry was posted in Fishing Reports and tagged Farmington River report, fly fishing, soft-hackled fly, soft-hackled pheasant tail, Steve Culton, wet fly fishing. What in the World are you using a metal Pole for ????? My fly rods are fiberglass. I’m not, Henry. “Aluminum-tipped” was my way of referring to the eye at the end of the rod. Yes, the “emergency bag ” is important. The day box of flies, clippers and spool of 5x along with sunscreen and bug repellent have all been used from mine. Fished the same time as you Sunday on the Farmington near Miss Porters.. The rain chased away most of the shore bound meat fishers. Fished a run they usually dominate and caught many Browns. Yes, I had the river all to myself, too.